[Spanish] Reportaje: San Francisco pondera la inauguración del primer inyectorio de los EE.UU. San Francisco city officials last Thursday took a tentative first step toward opening the nation's first safe injection site for drug users. In an effort to reduce the city's high number of fatal drug overdoses, as well as slow the spread of blood-borne infectious diseases, such as HIV and Hepatitis C, the city's public health department teamed up with a coalition of health and social service nonprofit groups to present a daylong forum on safe injection sites, how they work, and how they can be established. 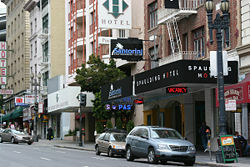 San Francisco's needle-using population is estimated at between 11,000 and 15,000, with many of them being homeless men. While injection-related HIV rates are relatively low, Hepatitis C is spreading quickly among drug users. About 40 San Franciscans die from drug overdoses each year. Injection drug use is also a quality of life issue for businesses and residents in areas of the city like the Tenderloin, where public injecting is not rare and dirty needles can be found on the streets. The neighborhood, a center of services for down and out residents, is often mentioned as a potential location for a safe injection site. Safe injection sites are up and running in some 27 cities in eight European countries, as well as Australia and Canada. They have been shown to reduce overdoses, needle-sharing, and the spread of disease, as well as entice some users into drug treatment -- all without causing increased drug use, crime or other social disorder. The symposium was cosponsored by the Harm Reduction Coalition, the Drug Policy Alliance, and the San Francisco AIDS Foundation, and was organized by a local consortium of community-based groups known as the Alliance for Saving Lives. That broad-based umbrella group includes public health officials, service providers, legal experts, injection drug users, and researchers. "Having the conversation today will help us figure out whether this is a way to reduce the harms and improve the health of our community," said Grant Colfax, director of HIV prevention for the San Francisco Department of Public Health. Vancouver's Insite safe injection site, the only one in North America, was held up as a model for a potential similar program in San Francisco. Both Dr. Thomas Kerr of the British Columbia Center on Excellence in AIDS, who has evaluated InSite, and the facility's program manager, Sarah Evans, addressed the forum about their experiences. Evans described the Downtown Eastside Vancouver facility as a bland place where drug users can come in and inject in a safe, sterile environment under medical supervision, then relax in a "chill out" room where they are observed. "It looks kind of like a hair salon," Evans said of the bustling space. "If we were a restaurant, we would be making a profit." While InSite has seen some 800 drug overdoses, said Kerr, none of them had been fatal because of the medical supervision available at the site. His research has found increases in addicts seeking treatment and decreases in abandoned syringes, needle-sharing, drug-related crime and other problems since the clinic opened three years ago, he said. Those findings suggest it is worth doing elsewhere, despite the criticism it will attract, Kerr said. But while the science appears to be on the side of such facilities, political reality is a different matter. San Francisco Mayor Gavin Newsome's office has said that he does not support safe injection sites, and by this week, even public health department spokesmen were keeping mum. "We're not talking to the media at all any more," Colfax said on Tuesday in response to inquiries about what comes next. While there has been community concern, the only vocal reaction has been coming from Washington, DC, where one senator, Republican James DeMint (SC), has introduced an amendment that would cut off federal health funds for any locality that starts a safe injection site, and where the Office of National Drug Control Policy (ONDCP) has attacked the idea via the press and its Pushing Back blog. Bertha Madras, ONDCP deputy director of demand reduction, told the Associated Press the fact that the idea was even being discussed was "disconcerting" and "poor public policy." According to Madras, "The underlying philosophy is 'We accept drug addiction, we accept the state of affairs as acceptable.' This is a form of giving up." But Hilary McQuie, Western Director for the Harm Reduction Coalition, and one of the guiding forces behind the push for a safe injection site in San Francisco, pronounced herself unworried about either DC opponent. "DeMint's measure is a rash overreaction that won't go anywhere," she predicted, "and as for ONDCP, well, I won't even debate them. It's none of their business; this is a local issue, not a national one." It's a local issue that McQuie and others have been working patiently on for some time now. "We initiated the Alliance for Saving Lives about a year ago," she explained. "It's mostly agencies that work with drug users, and we've been meeting monthly. We've had some quiet conversations with the health department, and we decided it was time to take the next step." Now it's time for advocates to build more community support for a safe injection site, including bringing the mayor and the Board of Supervisors on board. Even with science on their side, they have some work ahead of them. "We know the issues and the science," said Randy Shaw, a long-time community activist working on homeless issues in the Tenderloin, "but no one here wants more of these kinds of facilities." "Why should the poor people of the Tenderloin have to live with all these problems? There are junkies in Golden Gate Park, there are junkies in SOMA, there's more drug traffic at the 16th Street BART station than anywhere in the Tenderloin," he said. "If some neighborhood wants to accept it, that's fine, we just don't want it in the Tenderloin." City officials have made the neighborhood "a containment zone," Shaw complained. "We already have methadone clinics, needle exchanges, food programs, shelters, drug treatment programs. Now they don't even think about putting things in other neighborhoods." Some activists want to turn the Tenderloin into Hamsterdam, the industrial neighborhood turned into a drug trafficking free zone in the HBO show The Wire, Shaw said. "But we're a residential neighborhood." "It's controversial," conceded Tenderloin Economic Development Project executive director Julian Davis, a supporter of the idea. "Some folks think the Tenderloin already has too high a concentration of these kinds of services, while others think like this sort of facility would enable drug users as opposed to ending drug addiction in the Tenderloin." But Davis has a different perspective. "I look at the Tenderloin and I see that our city, our society is already enabling open drug use and drug dealing," he argued. "The idea behind the site is to get some of these users off the street and inside, where they can get access to services, and also to stop the needle-sharing and the spreading of HIV and Hep C. I see quite a few potential benefits from this." And so the public discussion begins in San Francisco. It will be a long and twisting path between here and an actually existing safe injection site, with much work to be done at the neighborhood, municipal, state, and federal levels. It could take years, but advocates are confident its day will come. "I think we will have a safe injection site eventually," McQuie predicted, "but how long that will take depends on how well we organize, who's in power, and how much pressure those in power locally feel from the feds." When are they going to open safe places to smoke pot? While marijuana users are not safe from legal action, they do not face the risk of death from the use of marijuana. No one I know has even been harmed by their use of marijuana, however many of my friends did not survive their IV heroin use. Equal time once those who live with the daily risk of a tragic death by drug overdose are protected and their lives are saved and recognized as being just as valuable as their non syringe using counterparts. I was staying on business, at Geary and Taylor. I have never seen such a blatant display of crack use in my life. And I have been to some seedy places. I mean they didn't even bother to go into alleys or behind buildings. I actually had someone take a pipe hit, ask me for money, and hit his pipe again. I was in a liquor store getting a bottle of wine, the girl in front of me, completely trashed, was buying a glass tube and brillo pad. Not being a crack smoker, I didn't know where people got their 'pipes' until I witnessed this and googled it later to find in fact that's where they are obtained. Is it difficult to spot these people? It wouldn't be if there was an officer anywhere in sight. I'm not necessarily a fan of the war on drugs, but if this is what containment and tolerance brings, I don't see it as a solution either. It's basically an open air crack house, in the middle of a district with nice older hotels where people stay for the value. So to save a few bucks you have to mingle with dope addicts. At first I thought it was just part of the 'craziness' of San Fran. But I began to realize that these people could easily turn violent if they needed money for a fix. There were families at my hotel, and I saw them walking out of the hotel and felt like warning the parents. Luckily I was alone, had I been with my family I would have been very concerned. But no one really seemed to blink an eye about it. It's an embarassment for the city. I really don't think it would be that hard to stop this, simply having police foot patrols would do it. How about banning glass tube sales in the area, hello? It's just a matter of time before something terrible happens there, IMO. Families and crack addicts do not mix. The hotel locked the front doors after 11pm like a compound. I couldn't wait to leave.